On a side note, I have noticed that most recipes that involve pumpkin dough forget to mention that when you try to roll it, the dough is going to be incredibly sticky and you’ll need to dust the dough with lots of flour, sometimes up to 1/2 a cup of flour. If this ever happens to you (with this recipe or others), feel free to dust the dough with as much flour as you need to be able to flatten or roll out the dough. As a general rule, this shouldn’t mess up your final product. 1. 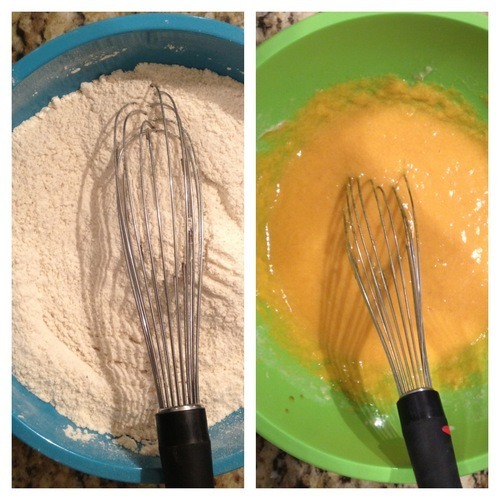 Whisk all of the dry ingredients in a big bowl (flour, baking powder, salt, spices, and sugar). Next, in a smaller bowl, whisk together the wet ingredients (butter, eggs, vanilla, buttermilk, and pumpkin). 2. Create a hole in the middle of the dry ingredients and pour in the wet ones. Mix thoroughly. Now roll the dough out into a flat rectangle, about 1/2 an inch thick. As I mentioned before, the dough will likely be very wet and will need to be dusted with flour to be able to flatten it. 3. 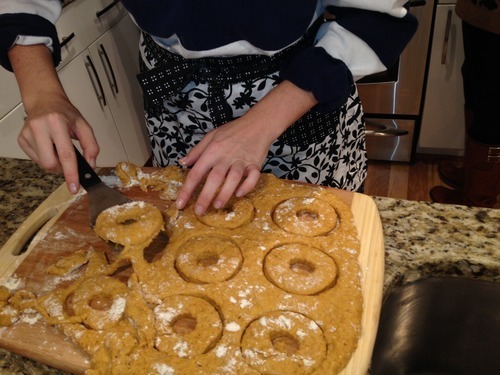 The recipe I used called for a donut cutter. I’m not even sure what this is, but I used a big oval cookie cutter and then a smaller one to get the right shapes. 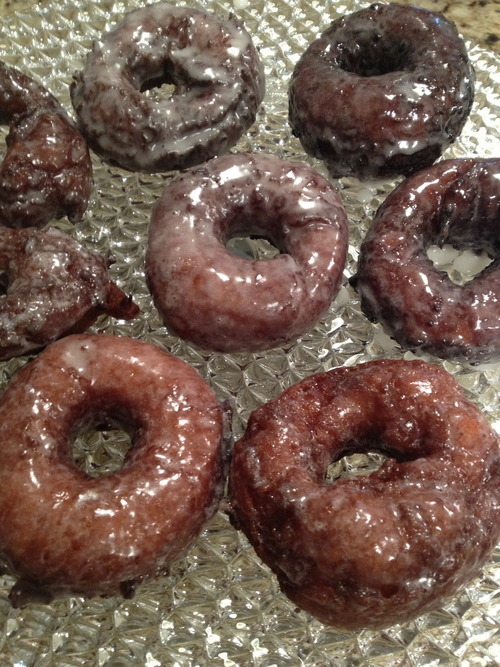 I only rolled out the dough once, and just threw out the scraps after cutting all of the donuts because I knew the 3 guests I was having for brunch wouldn’t be able to get through anymore donuts (and I didn’t need more leftovers after Thanksgiving). 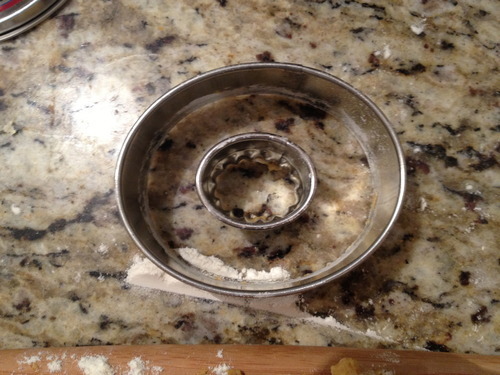 But after cutting holes in the dough once, you could roll out the scraps again and again until you had none left. 4. Once you have your dough ready, heat up the oil in a frying pan over medium-high heat. Use a pan with high sides to avoid splashing. You want about 1-2 inches of oil in the pan. 5. While the oil is heating, go ahead and make the buttermilk glaze. 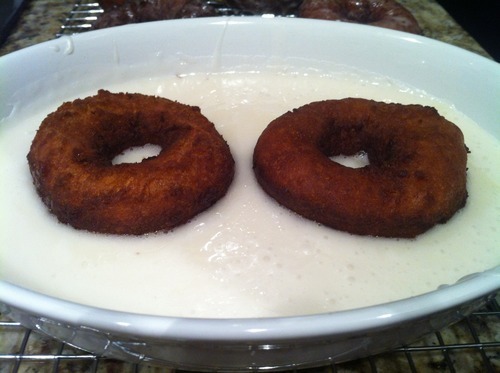 Whisk together the sugar, buttermilk, and vanilla in a flat bowl that you’ll be able to dip the donuts in. I used my electric mixer to make the glaze, but you could do by hand if necessary. 6. Next, you want to check to make sure the oil is hot enough. To do this, I dropped a scrap in. If it immediately starts to turn brown, you’ll know the oil is hot enough. Also, you can fully cook this scrap so you get a sense of how long to leave the donuts in and what they should look like when you’re done. 7. 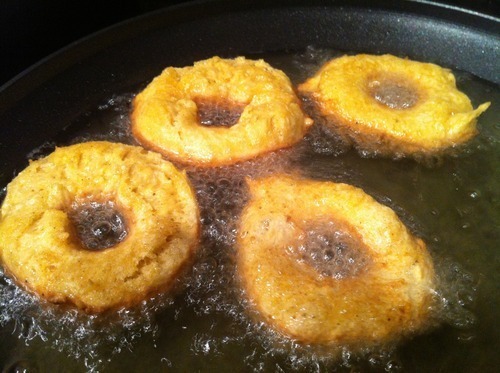 Once the oil is ready, drop in as many donuts as you can. They will take 1-2 minutes each to cook. Flip them over half way through. You want them to brown fully, but not start to turn too dark. 8. As soon as they are done, dunk them in the glaze and then let them dry on a rack for a minute or two. Serve as soon as they have cooled off. 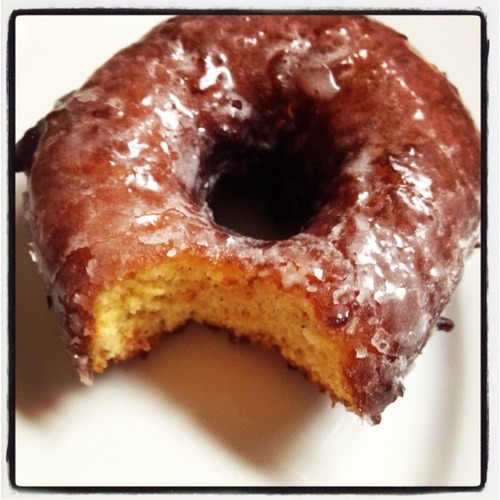 Now go host a brunch so you can impress your friends with homemade donuts! Side note: I often have to buy a whole bottle of buttermilk just to use a cup or two for a recipe. I’ve learned you can freeze it and defrost it for later use so that you do not have to waste any.